Election forecast for 2019 will be a replica of 2004 when Atal Bihari Vajpayee lost despite his popularity ratings being way above everybody else. The election season has begun. So has the season for opinion polls. We have already had at least three nationwide opinion polls, and all of them forecast a reduction in the tally for the BJP and its allies. But none put the BJP below 200 seats. This reinforces the political conclusion that the BJP is in the race to form the next government, with Narendra Modi as the PM if it does a little better — or without him if the tally is on the lower side. I believe these polls are wrong. There is no way the BJP can touch the 200-seat mark necessary for it to form the government in 2019. I do not think the pollsters are deliberating misleading us. I have been in this business of election forecasting. I know that pollsters hate to get their forecast wrong. And they pay big professional price when they do. The reason for a possible failure is technical. To understand this, let us turn to Prannoy Roy’s distinction between Type-1 error and Type-2 error in opinion polls. Type-1 is the most common error made by pollsters. They are risk averse, and hence play it safe. They get the winner right, but underestimate the extent of victory. Typical recent examples would be the AAP’s or the BJP’s sweep in Delhi or Uttar Pradesh, respectively. Most pollsters predicted the victor but almost no one got the extent of the victory right. Type-2 error is where one gets the victor wrong or predicts a big sweep that does not happen. This is every pollster’s nightmare, and often happens when the pollster takes a risk and goes strictly by what the numbers indicate. My own misadventure in projecting a clear defeat for the BJP in Gujarat in 2017 illustrates Type-2 error. I saw two credible polls showing a decline for the BJP in the last four weeks and simply projected it onto the final outcome. Pollsters who predicted a clean sweep for the Congress in Rajasthan based on correct pre-poll data made the same error. Pollsters prefer to make Type-1 error and avoid Type-2 error as much as possible. Yet there is a special case where a series of Type-1 errors can lead them into making Type-2 error. A tendency to play it safe can land the pollsters into the most risky situation of getting the victor and the loser wrong. This is what is likely to happen with the pollsters in 2019. The same thing happened in 2004 as well. Atal Bihari Vajpayee had completed a seemingly successful five-year tenure. His popularity ratings were way above that of any opposition leader. The economy was allegedly “shining”. And the BJP had won the three state assembly elections in Rajasthan, Madhya Pradesh and Chhattisgarh. When Vajpayee advanced the general elections by six months, every poll expected the NDA to come back with over 300 seats. Pre-election polls closer to the election date gave an average of 271 seats to the NDA. The average of all the exit polls was 255 seats for Atal-led alliance. Everything pointed to another term for Atalji. When the results came, the NDA won 187 seats. With the BJP’s own tally at a paltry 138, he was nowhere in the race. What went wrong in 2004? Basically, all the pollsters played it safe in estimating the loss of seats for the BJP. But since they made the same error in a number of states, the accumulation of small errors led to a big blunder. Normally, Lok Sabha elections are safer to predict, as Type-1 errors at the state levels tend to cancel each other out at the national level. You over-estimate a party in one state but under-estimate it in another state. But in 2004, all pollsters played it safe by understating the BJP’s losses in most of the states, especially in states where the party was in direct contest with the Congress. Instead of cancelling one another, forecasting errors stacked up. Thus, a typical Type-1 error resulted in a Type-2 error, one of the most embarrassing polling blunders of recent times. Also read: What will Narendra Modi do if he is not PM in 2019? Election forecasting for 2019 threatens to be a replica. The normal logic of errors cancelling one another out may hold good for the 317 seats in the area outside the Hindi belt. For example, an underestimation of the extent of the DMK alliance victory in Tamil Nadu may be balanced by an under-estimation of the YSR Congress. Similarly, over-estimation of the Congress in Gujarat may be balanced by its under-estimation in Karnataka. But in the case of the 226 seats in the Hindi belt, all the errors are likely to be loaded in one direction. The BJP had won 191 seats (202 if you include allies) here in 2014. It can only shed seats everywhere. Any forecaster who plays it safe will understate the BJP’s losses in every state. So, if the poll shows 12 seats for the BJP in Uttar Pradesh, the pollster is likely to jack it up to 20. If it shows 10 seats for the Congress in Chhattisgarh, a conservative pollster would slash it to seven. Since all these errors would favour the BJP, it would add up to anything between 30 to 50 seats of over-estimation for the ruling party. I am not recommending that you stop following the opinion polls and the forecast this election. On the contrary, I have always argued that a half-decent survey is more informative than drawing room or newsroom gossip. I would just suggest that you focus on the real and interesting trends, instead of just looking at the forecast of the number of seats for each party. The more interesting and useful information in an election survey is about percentage of votes for each party, its distribution across social segments, and the evaluation of the government and its leaders. If you do look at the number of seats predicted for different parties, just mentally chop off 30-50 seats from the BJP’s tally. This article has been updated to reflect a correction in the number of seats the BJP had won in the 2004 general elections. Its a known fact that you are paid to be anti bjp and to hate modi…..just because YOU WANT bjp/modi to lose, its not going happen…whatever will be will be…..dont do predictions based on what you WANT and WISH…..your cheap tactics to mislead ppl is not gonna work as ur reach is near zilch naDa…. 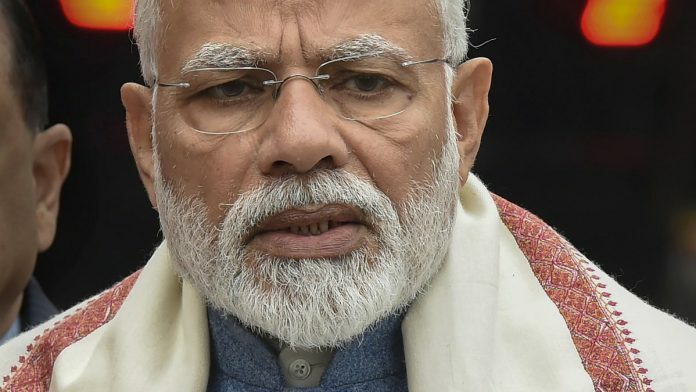 The recent skirmish with Pakistan in which, India lost an aircraft and the pilot was captured has given Modi a boost for now. Hopefully it will dissipate before the elections. He should be judged solely on his ability to improve lives of its citizens. We are near bottom in the human development index, in curbing pollution and providing health care. He is a failure. This article is written by ex-member of AAP party of kejriwal. Now yogendra yadav formed his own party. Got 0% response from public. It is his wishful thinking. We can see him in ND tv panel discussion along with Pranob Roy giving reasons for the victory of BJP and failure of Mahamilavat. The so called psephologist is the agent of anti BJP political parties to affect the poll outcome. Yogendra yadav and Prannoy roy. Good combination. What else we can expect from him. Its very unfortunate to compare Vaipayee with Modi. Vajpayee was like RAMA. But Modi is like KRISHNA. Modi(Krishna) is going to do many MIRACLES in forthcoming years. WAIT AND WATCH. Last 10 years saw wide mobile coverage, Very few are away from social media. Buy even then these political analysts still count castes and regional factors for LS election for 2019. Modi succeeded in reaching the people directly almost eliminating the role of activists except for the polling days to bring the voters out. Voters are now far better informed. Fooling them will not be easy. Naturally then Modi scores. Priyanka factors will not work for that reason. Psephologist failed to predict full majority of BJP in 2014. All opinion polls in predicting SP’s victory in 2012 in UP , 73 seats to NDA in 2014 in UP and 300+ seats to BJP in 2017 UP assembly election. Means Psephologist failed in last three major elections happens in UP to get clear picture on ground. Now whatever opinion polls happened for LS 2019, all were giving BJP & NDA lesser seats than 2014 mostly based on UP considering SP – BSP would sweep and BJP possibly loosing 30 to 50 seats in UP only. UP people are one of the highest politically awaken people , state has highest population and complex cast structure. Very tough to predict real picture. And whatever opinion poll right now showing is based on assumption that all SP & BSP votes are transferable to each other which can be go wrong during real election. Even 30% voters of SP & BSP don’t want for each other and instead go to BJP (considering national election and voting for PM than state leader), BJP will be sweeping UP like 2014 . And such scenario, BJP & NDA may cross its 2014 tally as no one can denied that BJP is going to add at least 20 to 50 LS seats from Orrissa, West Bengal, North East . So, you are right, Mr Yadav that Psephologist are going to wrong in LS 2019 but not in predicting hung assembly but they are going to fail in judging Modi’s 2019 victory. BJP & NDA are going to increase its tally in 2019 and against all oppositions would be crying on name of “EVM”. Yogendra ji has committed same mistake of avoiding Type 2 error while writing this article. Just like polesters he too doesnt have any clue of what is going to happen. BJP can end up with 44 and UPA 300+. When was the last time Yogendra ji got his poll predictions right? Modi comes again even after paid media prediction otherwise. Common people knew everything. Silly Rahufail Khan given much hype by paid media. Bjp alone cross mark of 300 seats. The modi wave is declining rapidly and steadily, once it starts on a downward path, we cannot guess how steep the fall will be. With a complete mandate for BJP in 2014, they have lost a good opportunity in bringing transformation. Now i don’t want any party to get a complete mandate as this only breeds fascism at various levels. A coalition like pv narsimharao govt in 1991, vajpayee govt and UPA 1 served better in the past rather than a single party having a complete mandate. Each and every election has a different results, the only different is the media mint money !!!! If there are only 2 choices 1)BJP 2)Non-BJP, then give two opinion, one has to be 100% correct. It is head I win and tail you loose. The only thing is before election , media just mint the money, with due respect hindi channel. i agree. This is a case of a biased and prejudiced view masquerading in the ‘voice of reasonableness and facts’ . The truth is any such ‘firm’ prediction is impossible especially by specialists like Yogendra. Philip Tetlock makes this convincingly in his book ‘ Super forecasters’. The most accurate predictions came from outliers, non experts with an open mind willing to listen to all unconventional sources of information. Such an article in modi’s favor would have seen wide coverage and extensive comments, esp if it appeared in swarajya. The fact that this is only the 4th comment in 24 hours only mean that buzz in favor of congress is missing. And BJP is never short of buzz. In fact, yogendra is right in saying that type 1 errors are likely to add up all in one direction. He is incorrectly predicting that direction however. The micro errors are all underestimating bjp rather than overestimating. Also consider that modi is a far shrewder politician than abv. He can still swing an election at the last moment. I predict that bjp will return with a bigger majority, whatever be the size of increase. Excellent analysis. Yogendra Yadav is one sensible voice among the cacophony of noises. Yogendra ji, despite of All these years in psephology, I doubt you have understood the nation’s mood this time… voting percentage of Modi followers will make a huge impact and he will be back with a bang… these are one of the most decisive elections in history of Indian democratic politics. I see no real alternative to Modi led BJP at this time. State polls are different but at the national level, it’s all BJP. I am sure, people of India would recognize this and bring BJP back to power. Good that few state defeats are needed for BJP to weaken their arrogance. 2. Starting with comfortable majority, NDA’s fortunes rapidly declined in pre-election months. The results were still worse than the latest opinion polls for the NDA, but not upside down as suggested by the article. 3. The article seeks to project replica of 2004. But doesn’t take into account lost credibility of the MSM (which played spoilsport in 2004), advent of the SM which immediately exposes lies of the MSM, etc. 2004 is not 2019. As a former pollster the author would know better than any one else that his prediction is coming a bit too early. He would know, for sure, that the fence voters decided about a week before the election and therefore exit polls are usually closer to the reality. This article looks like his own wish list. I have seen several elections over the last three decades to be humble about such stands which often fall by the way side. It is Feku Modi who is “illiterate”. His economy has been a disaster. In 2004, it was 145 for the Congress, 138 for the BJP. Add 43 for the CPM and 40 for the DMK. No wonder Pranabda had taken the trouble to fight the first Lok Sabha election of his life. 2. What should worry the incumbent now are direction and momentum, which seem to be moving away from it. Difficult to see where the tailwind could come from. The bottom line would appear to be that the BJP will shed seats BUT, WILL form the next Government in only a few months time. That is all that matters, as the alternative of a motley gang of leaders acting like ‘Crabs in a barrel’, and politically illiterate amateurs having sky high ambitions to bring Modi down and occupy his chair, is too frightful and nightmarish. These pollsters clearly do not know the “agony of the voiceless”, which is high in Modi regime. If polling machinery is impartial, as it should be, then we should see Modi ji bidding us tata bye bye for at least five years. As if u know everything……what an hypocrite….